The First Friday Art Walk and Luminarias Festival unite on Friday, December 7 for a free evening in Denver's Art District on Santa Fe. As always, hundreds of artists will be displaying work in studios and galleries along Santa Fe Drive with late-night hours in addition to Luminarias festivities. Enjoy a visit from Santa and Mrs. Claus, who will be roaming the galleries along the Luminarias path. Luminarias—or Farolitos—are a tradition of the southwest. Candles are carefully placed in sand inside of a bag, providing a warm glow that will take over Santa Fe Drive in Denver for one night only. Farolito means “little lantern” in Spanish, and luminary, or luminaria, means “festival light.” The term luminaria was used in reference to a vigil bonfire, though it’s primarily northern New Mexicans who have kept this distinction. This event is brought to you by a collaboration between Denver's Art District on Santa Fe and the Santa Fe Drive Business Improvement District. 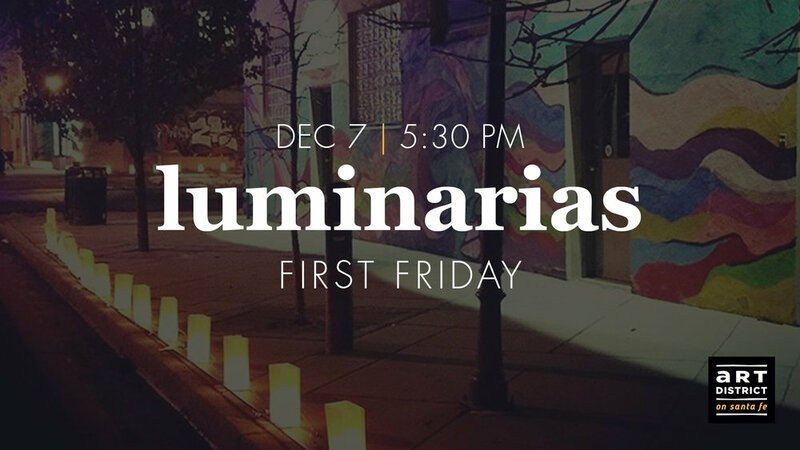 Whether you call it a farolito or a luminaria, art and culture unite on December 7 for Luminarias First Friday. The heart of the art walk is between 7th and 10th Avenues on Santa Fe Drive, with more galleries scattered nearby. To get here, take the Light Rail to 10th and Osage or opt for a ride share, as parking is difficult.